You can expect to be welcomed as you enter. As our guest, we want you to feel at home. So grab a cup of coffee or tea as you enter. You can come as you are; there's no need to dress up or try to impress. We're a laid-back bunch; most of us wear comfortable, casual clothing. You can be sure that the last thing we want to do is to embarrass you. We won't drag you up front or announce your name from the pulpit. We want you to feel free to come and explore without feeling pressured. We want our church to be a safe place for you to visit. You can expect a nursery for infants. And for toddlers and elementary-age children, your children will be well cared for during Sunday school, which begins during the last half of our Sunday morning worship service. You can expect a blend of music — from traditional hymns to contemporary worship songs. We like to sing and we like variety. We hope that you'll join in as all generations come together to sing and worship the Lord. You can expect to hear a message from the pastor, which is based on Scripture and is relevant to life. Pastor Jeff has a good sense of humor and that often manages to find its way into his messages. Watch his recent message videos. Join us as we worship together. Sing joyful songs of praise with us. 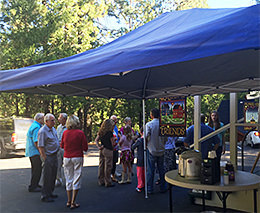 Come early for coffee and fellowship. 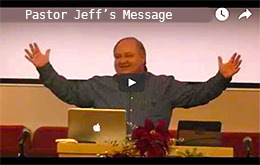 Hear Pastor Jeff as he shares his Sunday morning message.